As Jason and I head back home from Quilt Market today (the semi-annual trade show), I’ll share a quick summary of our weekend. As you know, there are two main parts of our business – the precut side which Jason is in charge of, and the designer side, which is the fun stuff I get to do. 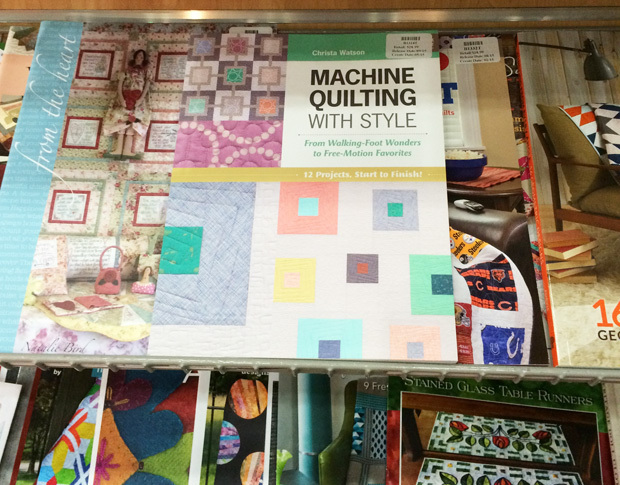 My “schoolhouse” presentation was a success – I spoke to a packed room about my new book Machine Quilting With Style. 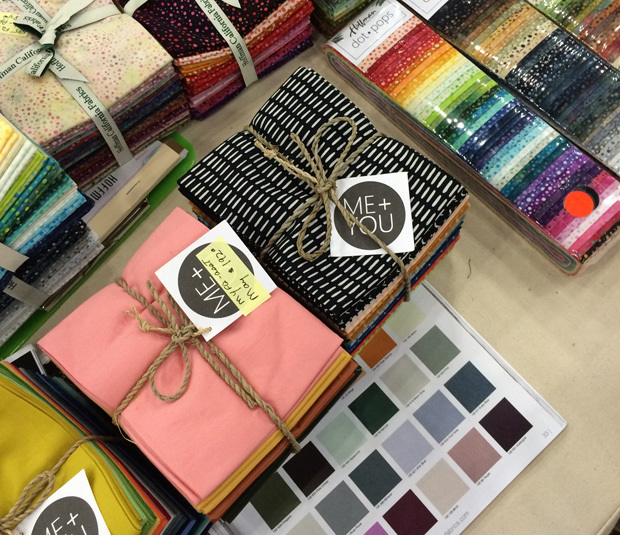 I shared all of the quilts from the book, plus tips and tricks on how shop owners could successfully sell the book in their stores, and how to build workshops and demos around it. I even had a couple of excited shop owners come up to me after the fact, inviting me out to their stores to teach. Sounds fun to me! 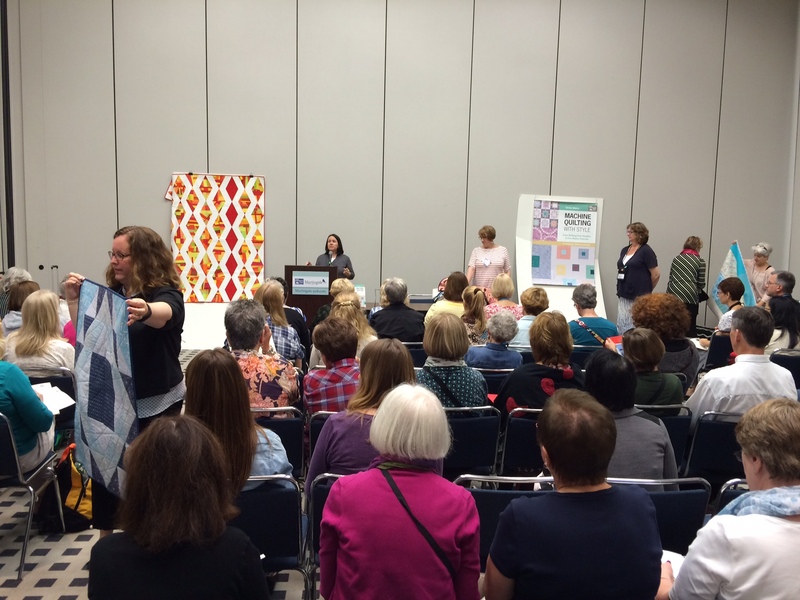 While I was presenting additional demos in my publisher‘s booth and networking with other quilting professionals throughout the weekend, Jason was meeting with our vendors to purchase luscious new precuts for our store. I really fell in love with these new Modern batiks from Hoffman. That’s right – MODERN batiks. I’m so excited for these!! It’s called ME & YOU and the line features modern geometrics plus solid batiks that are really solid – no mottled designs here! These will be available in the spring. I also had a chance to check in with a couple of distributors that are now carrying my patterns and books. Hanging some of the quilts on display entices shop owners to come in and hopefully purchase those patterns for their stores! 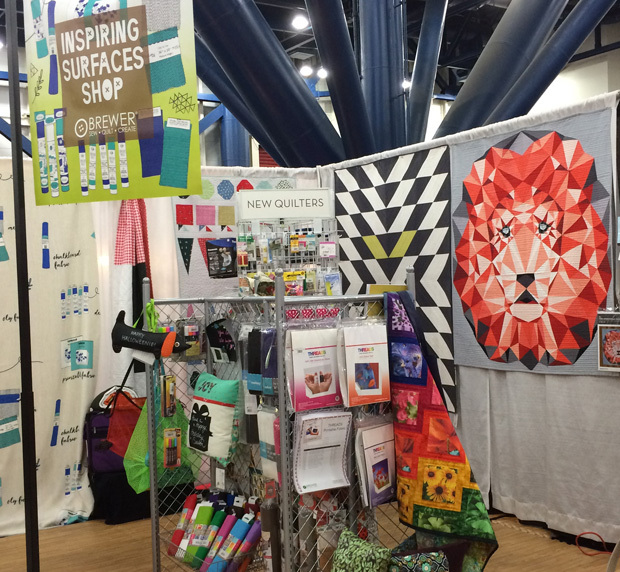 It was thrilling to see my Modern X quilt hanging in the Brewer sales booth, right next to Violet Craft’s amazing Lion pattern. And I was pleased to see my book prominently on display in both the Checker Distributors booth as well as at United Notions (the notions/patterns/book arm of Moda). One of the fun parts of going to market is getting to check out all of the new products and equipment on display. 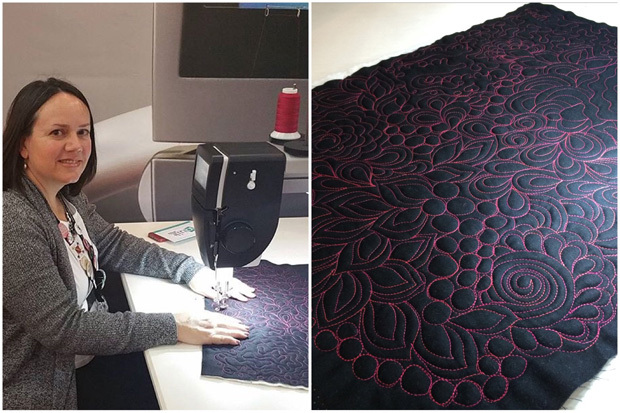 I’ve recently been invited to become a BERNINA ambassador (more about that later), so I got to play around on their new Q 20 sit-down machine for a bit. I instantly fell in love with the sit-down long-arm and started thinking about whether or not I’d have room for one of these in my home! It was a great weekend getting to connect with other industry friends that I only see at events like these. Now I’m ready to get home and get back to work! It sounds like it was a great trip. I hope to get to see it myself one day. Want to hear more about your experience with the Bernina Sit Down Long Arm! It’s so great that you can get to see the interest in your books and classes. I love batiks, and seeing a new kind of batik will be great. On the sit down machine, my experience has been that using the frame can be fun if you have a light weight machine, (which I don’t have) it’s a lot easier to move around, but I’ve used it as a sit down and it is only a straight stitch machine, but I like the throat space on it, mine is 15″, It’s just right for me and I have all the control of the quilting of larger quilts. Hope that helps! You must be exhausted with excitement. Sounds like you had an amazing time at Market! I am glad you had a great time. I am a big fan and have started to see the advantages of precuts for fast fun projects and have tried several times to buy from you. I will say I have not because i find your “store” very difficult to navigate. Most frustrating is when there is not a color card with some of the products showing you the full line up. I would also suggest that you subcategorize so that you can find by color and also have suggestions of what might match up with each particular product. If you really want to be the go to precut source you need to make it extremely user friendly with accessible customer service. Looks like fun and successful weekend for you! Modern Batiks?! Can’t wait to see more of those!